Barrister's Block is surrounded by rolling Adelaide Hills, well watered vineyards and a perfect wedding venue for a country, relaxed, barn wedding. Barrister's Block Wines is at the end of the group of shops on the Main Road of Woodside but tucked away behind shrubs and trees so you are in your own little oasis with fields of vines at the back and on the right side and a lovely forest on the left. Geese and deer roam the fenced paddocks - there are so many opportunities for beautiful photos with the vines, the trees and the lake. There is even a rustic shed over the dam which makes for great photo opportunities for newly weds. 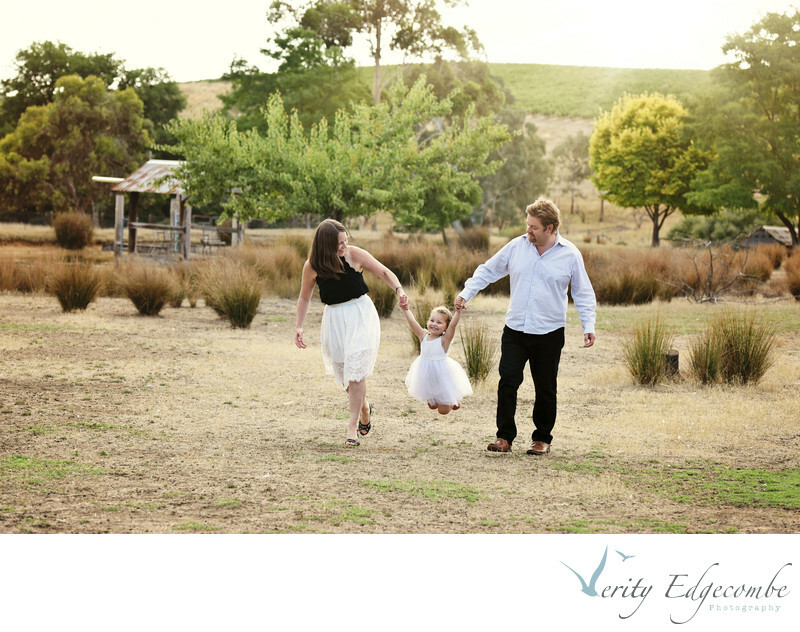 This photo above is of one of the little flowergirls with her Mum and Dad, coming in after the photos. this bride and groom wanted a few photos away from Barristers Block so we found a beautiful garden down the road for some photos. I have photographed 5 weddings at Barrister's Block and all of them have been completely different and unique. Barrister's Block staff encourage couples to do their own thing, to use as much creative flare as you and your wedding coordinator to pull off a fun and relaxed day your guests will love. I always create images for each wedding so they are unique to the couple - sometimes we even take some time out at a venue close by to get different looks. Your ceremony can be under the trees facing the rows of vines. Geese have been known to come to the fence line during the ceremony and have a look at the proceedings! Guests can enjoy the wineries vintage while you have your wedding photos or you can move straight into cocktail hour with your guests and have your photos over the lake as the sun falls behind the hills. Rain is not really a problem as there is room on the lawns for a marquee for the ceremony and afternoon tea and then you can move into the Barn for your reception. Barrister's Block books fast so I understand you have to book well in advance for this beautiful wedding venue. Vigneron Villa is available for hire the night before and the night of your wedding. This makes things extra relaxed as you just walk out the front door and straight down the aisle! Barrister's staff put signs up near the driveway so guests don't come too near the house and spoil the surprise! Location: 141 Onkaparinga Valley Rd, Woodside, South Australia.